Photographer Don McCullin photographed a starving, albino Biafran boy in 1969. He later described the photo as one of the most obscene that he has ever taken.“To be a starving Biafran orphan was to be in a most pitiable situation, but to be a starving albino Biafran was to be in a position beyond description,” McCullin wrote. The photo profoundly influenced public opinion, pressured governments to take action, and led to massive airlifts of food, medicine and weapons. An American woman tells the story of living, loving, working in Africa as a Peace Corps volunteer. In Nigeria, she falls in love with an Igbo man and they move to eastern Nigeria to escape the persecutions of Igbo people. But the eastern part of the country was also undergoing change: it briefly rebelled to become the Republic of Biafra and a war had begun. The 1967-70 Nigerian Civil War (also known as the “Biafran War”) was notorious for the prolonged suffering of the civilian population in the secessionist enclave of “Biafra” and the failure of repeated international attempts to bring about an early end to the conflict. At the time the term “humanitarian intervention” was used to denote the international emergency relief operation, rather than a military intervention – which is how the term has subsequently come to be used. I compare this state of affairs with subsequent approaches to intervention in Africa and elsewhere and conclude by suggesting that the lessons from “Biafra” could be used to inform a more enlightened approach to “humanitarian intervention” in present-day crises. A 10-part series of stories of experiences, triumphs and woes, told by some of the Biafran fighters engaged in the three-year Nigerian Civil war. (Text / Video) Nigerian reggae musician Ben Okafor was 15 years old when the Biafran war ended. He witnessed the moment in 1967 when Biafra declared independence from Nigeria, sparking the conflict. In David Koren I met a veritable hero. No, he is not the kind of hero that Hollywood or Nollywood rushes to immortalize. Yet, he’s the truest, grittiest kind of hero—by the measure of the difference he made, the depth of his humanity. 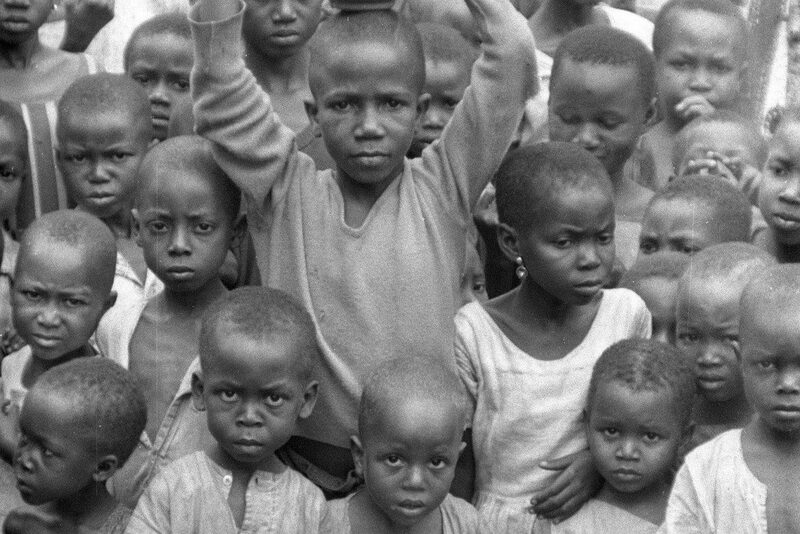 In 1968, thanks to the relatively recent invention of broadcast television, the world was horrified by images of young Biafran children starving en masse during the Nigerian civil war. The international call to action was overwhelming. Just before you say Biafra, know and remember that the ideals of Nigeria have not been tried and found wanting. Instead, they have been found difficult and left untried. Except in extremely isolated cases—for example, as an act of self-defense—it is morally indefensible for individuals to engage in extra-judicial killing. When a government makes it its business to slaughter unarmed citizens, that government reveals itself as criminally thuggish. And the state in whose behalf that government kills loses its moral legitimacy. Washington Post editor, Karen Attiah, travels to Nigeria, her mother’s homeland to uncover a painful part of her family’s history. The first time I went to Africa the sun was rising over an endless stretch of palm trees as the Pan Am Boeing 707 banked steeply on approach to Lagos Nigeria, January 1st 1964. There is a “Kingdom of Biafra” on some old maps which were made by early white explorers of the west coast of Africa. Nobody is now sure what that kingdom was, what its laws and arts and tools were like. No tales survive of the kings and queens. This memorandum was prepared by the staff of the Commission on International Affairs because of numerous requests for information about the origin, extent and implications of the Biafran conflict. I have been distressed beyond words by what has crystallized as an agitation for Biafra’s divorce from Nigeria. I am disturbed that this agitation has become another occasion for the Nigerian state to demonstrate its disdain for the rule of law and the rights of citizens. On 30 May, 1967, the head of the Eastern Region of Nigeria, Colonel Emeka Ojukwu, unilaterally declared the independent Republic of Biafra. The spirits of dead Biafrans must have smiled. Igbos from all walks of life came out en masse to welcome the leader of the Movement for the Actualization of the Sovereign State of Biafra (MASSOB).